At Jefferson Monroe Fire department we are made of a wide variety of people and backgrounds. 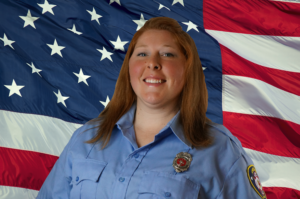 Cera is one of our first responders who recently completed her National Firefighter I Certification and holds an EMT – P certification. There is little she can’t do in an emergency situation. She is a long term Swisher, Iowan who has traveled the nation and world protecting our freedoms. As a mother of two and #3 on the way Cera and her husband have found a calling in the community they feel rooted in. See Interview below to learn more about Cera. 1.When did you join JMFD? 2. What motivated you to join? Why JMFD? Chief Heims was a motivating factor! My husband Liam and I are both military vets, as combat medics we deployed in separate units in 2010/2011. Leaving the military was hard for us because we lost that sense of community and brotherhood we had depended on for almost 10 years. Chief Heims asking me to check it out was just the motivation I needed. My dad was also a member of JMFD as a first responder and firefighter when I was young. I remember him running out the door and jumping on the back of the fire truck as it drove past the house. I was scared for him knowing that he may not come home, but he was willing to put his life on the line to help our neighbors. Growing up in Swisher gave me a sense of community, you know your neighbors, and you want to be able to help them. I think this sense of community is what pushed me to pursue a career in civil service. 3. Can you tell us about your family, your home life, what’s a day like at the Wilkins household? My husband Liam is incredibly supportive of my choice to join JMFD. We also have two children 8 and 3, and I am currently pregnant with #3! Since moving back to Swisher I have become a stay at home mom to better homeschool our 8 yo, who is also a member of Anderson ATA Taekwondo in North Liberty. We also have 2 rescue dogs, 2 ​cats​, and an iguana. We love living close to the park and try to take walks there, weather permitting, as often as possible. We love to hike, camp and stay as active as possible! 4. You recently finished your National Fire Fighter I Certification. Can you give us some insight as to how that went? Was it stressful? Lots of time commitment? What helped you get through the Certification? FF1 was the first certification class I have taken since high school that I felt completely out of my element from the get go. It was stressful because it wasn’t second nature, I had to study, and re-read​ sections of the book. Fire Science is mind boggling​! It wasn’t a huge time commitment because class was only once a week with a Saturday each month dedicated to skills. It was great going through class with a few other class mates from the department. We were able to set up hands on skills stations, and practical run through to make sure our skills were on point. I remember the first fire I responded to (before I completed FF1/Hazmat) and had no idea what I was doing, I wasn’t able to look at the fire and see what could possibly happen or what needed to happen. The most recent fire I responded to I was in the second truck, and knew exactly what we needed to do when we got there, and was able to look at the fire and smoke and know what was potentially going on in the fire, it was incredible! 5. As a member at JMFD what is your favorite memory with the department? ​My favorite memories at JMFD so far, has to be the down time after calls and meetings. We are able to sit down, chat and connect with each other. It has been great to be able to pass my knowledge on to other members of the department. 6. What’s your favorite thing about being on the fire department? ​A sense of belonging and purpose. Knowing that my skills are valuable and needed. I suppose that I could get that feeling from any department, but knowing that our community is so small and the residents are appreciative when we arrive, really cement that feeling of purpose into place. It has made me more aware of community issues, and how some of these issues could affect home life and the surrounding community. I am more observant when out and about especially when I see smoke in the air. If I see something that isn’t safe I am more likely to bring it up to someone instead of just letting it go. 8. What do you have in store for your future at JMFD? What are you looking forward to?